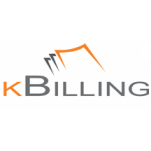 kBilling is a great billing / invoice program for any business. Whether you're sending bills for your professional services, running a retail store, invoicing customers for repair work, or running an Internet business, kBilling can simplify your billing and save you time and money. You don't have to be - or hire - an accountant to use kBilling. You can install kBilling and increase your productivity immediately!